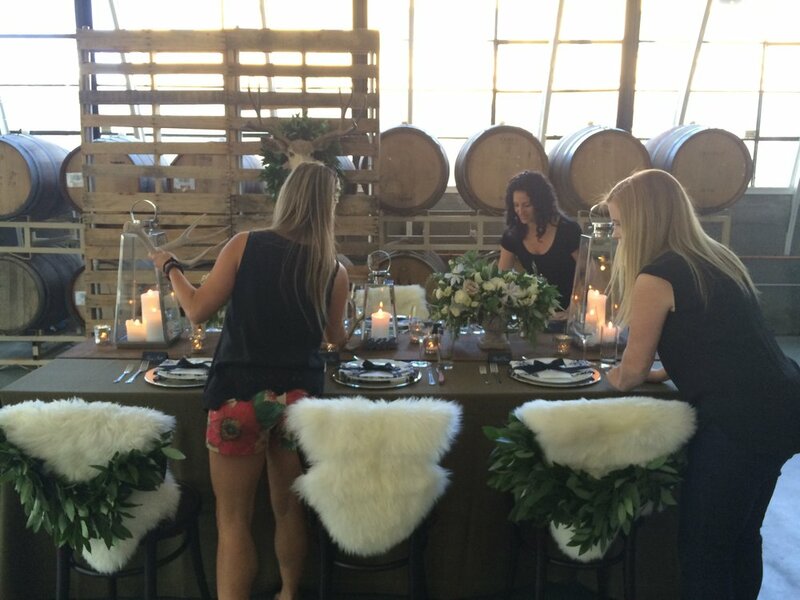 With a venue like Cooper's Hall, creating an elegant yet comfortable vibe is not a hard feat. 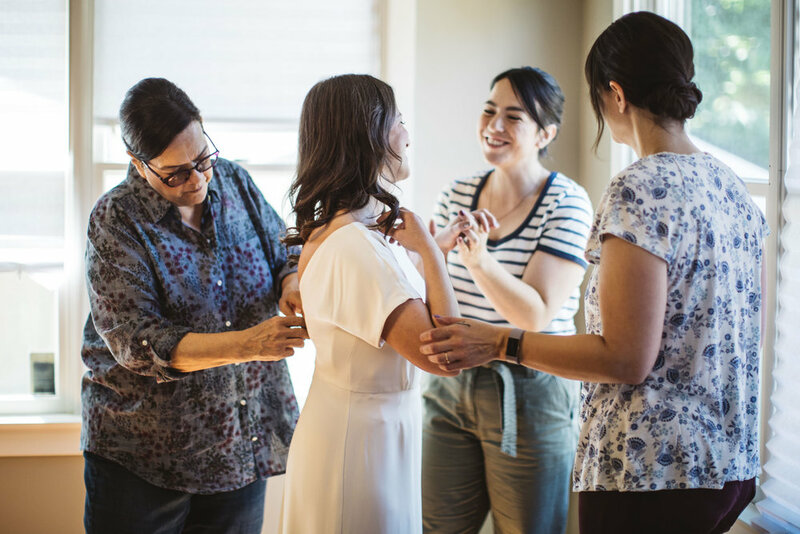 Alyssa had a great aesthetic and knew exactly the look she wanted for her wedding, and it did not disappoint. 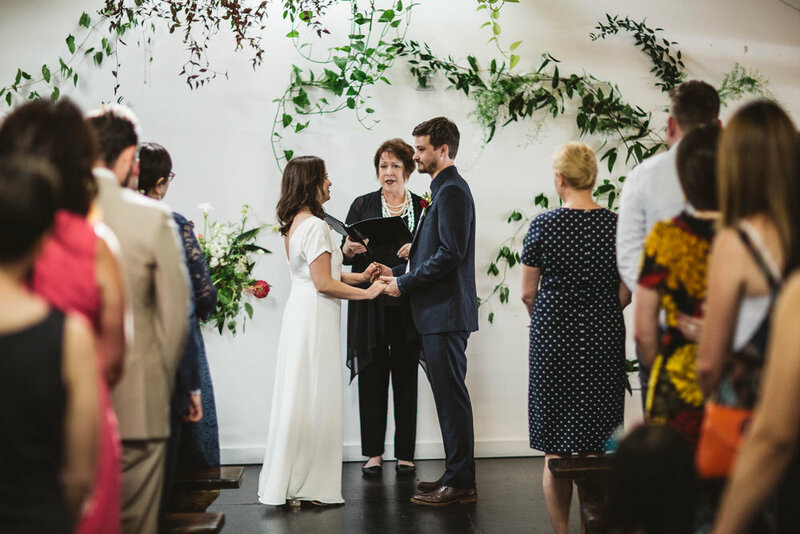 Anna Mara created a lovely viney backdrop along the wall where the couple said their vows in front of an intimate group of friends. During the reception, guests were escorted to their seats with vintage medicine bottles, filled with floral, which also acted as a favor. During the reception, guests were escorted to their seats with vintage medicine bottles, filled with floral, which also acted as a favor. 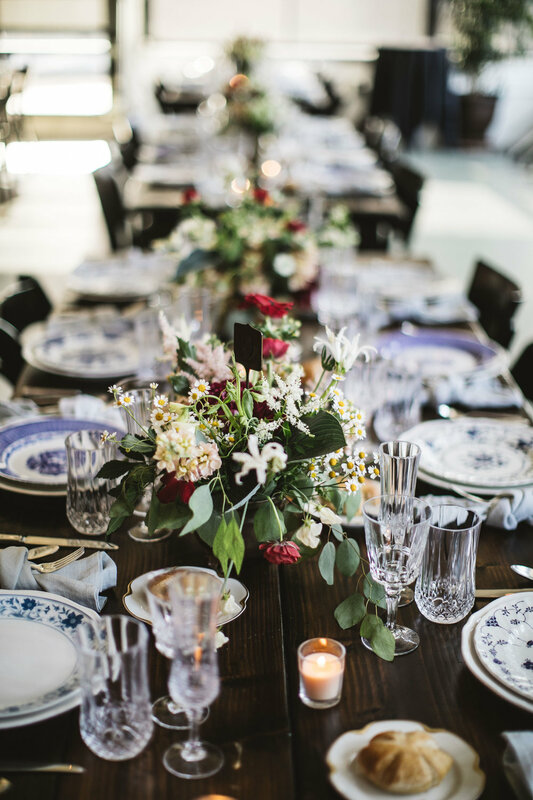 Classic Vintage Rentals provided vintage farm tables, set with gorgeous vintage blue and white china on top of a white decorative charger. 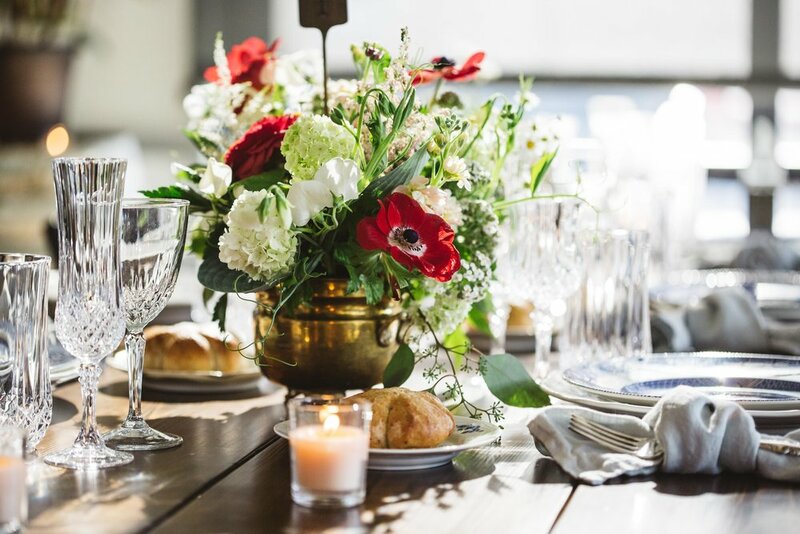 An assortment of crystal glassware at each setting along with mismatched vintage silverware knotted into a soft blue napkin set by florals in ivories, blush and pops of red inside gold vessels along with votive candles gave the room a soft and romantic feel. After delicious food and an evening of dancing, guests enjoyed Voodoo Donuts served out of the Voodoo Truck late night. So fun! Congrats you two! Recently the crew at PORTLAND BRIDE & GROOM MAGAZINE asked us to design an entire spread at Cooper's Hall for the new issue that was released just this month. We pitched a few ideas and thankfully they chose my favorite…”Winter Wonderland” meets “Ralph Lauren Chic” which was shot at Cooper’s Hall. ELIZABETH CORR and I were able to put our minds together, get creative and really make the magazine feature beautiful and cozy. We have several copies at our office so feel free to stop by and pick one up–it is a GORGEOUS ISSUE! The spread came together amazingly well, and we loved so many different aspects. 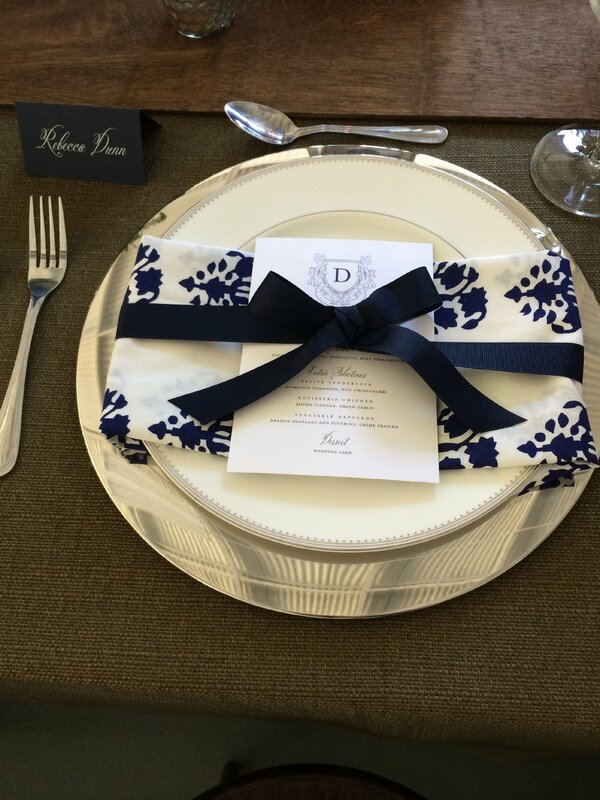 Our favorites were the CHIC CHAIR COVERINGS and the place settings. The elegant china and silver chargers worked so well with CREATIVELY DESIGNED MENUS, geometric napkins and a charming bow. The entire design had a masculine feel, but was softened up by textural elements such as the fur and the grosgrain ribbon. 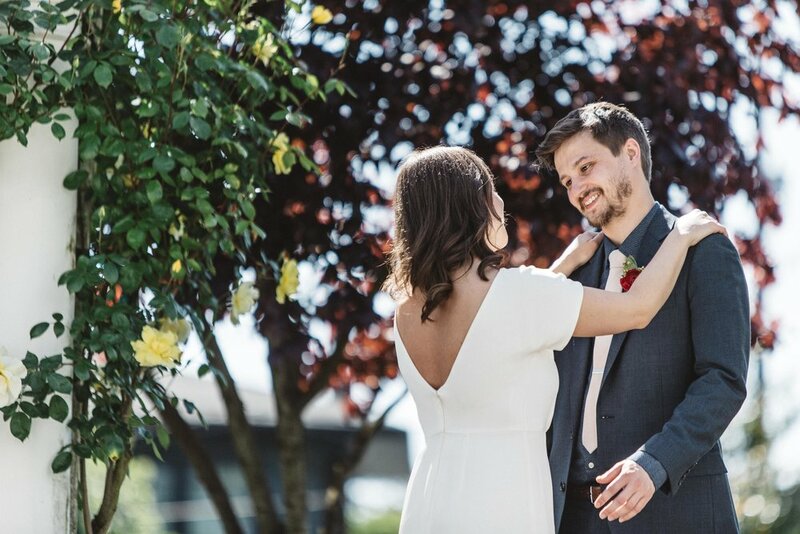 Between the hot chocolate, the LUSH FLOWERS, the plush blanket favors and the delightful MAC & CHEESE, the entire spread gave us a warm fuzzy feeling! With a rock star team including ZEST FLORAL, AK CAKE DESIGN, ROYCE PROP SHOP, PAPER BLOOM, and BBJ LINEN we couldn’t go wrong! 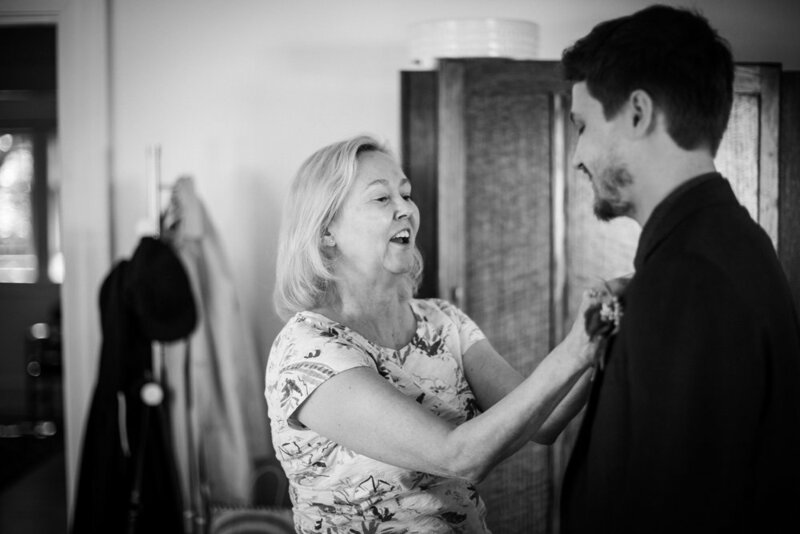 Thank you to Anna and everyone at Portland Bride & Groom for including us in this—we had a great time and always love working with you We had to take a few behind the scenes shots–such a fun crew!